It looks like I may have been mistaken earlier this week when I wrote that I didn't know when the Kobo Glo would be coming to the US. 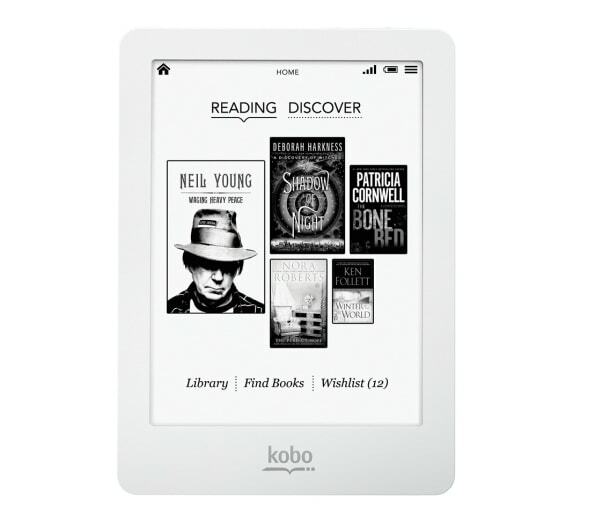 Apparently some ABA member stores have Kobo's new 6" ereader in stock. Whether they have any that work, well, that's another matter. I've just seen a copy of an email which the ABA has been sending out to some of their member stores. Not all ABA members are participating in the plan to lose money selling Kobo ebooks and hardware, but the ones who do have the gadgets already seem to have reported a serious number of issues with the Kobo Glo. The email explains how the booksellers can perform a basic reset. If that doesn't work they are to take the demo unit out of the display frame and repeat the reset. And if that still doesn't work then the bookseller is advised to perform a factory reset, and should that also fail 1take the Kobo Glo demo unit out back and shoot it. There's no indication about how many booksellers are reporting the issues but clearly the number is high enough. Whoever is coordinating the Kobo program at the ABA thought it worthwhile to warn all participants. This is not good news for Kobo, and it's a sign that the Kobo Glo could have much the same hardware issues as the Kobo Touch. Kobo never did get all the bugs out of that older ereader; I'm still getting new comments on the post from last year in which I complained about the touchscreen. If the Kobo Glo develops the same reputation then Kobo should really consider looking for a new hardware partner. Netronix, the current developer of Kobo's ereaders, doesn't exactly have a reputation for skill and competence. It looks like the problem with the Kobo devices isn’t the hardware, it’s the firmware. Kobo doesn’t have their software development process debugged and is unable (or unwilling) to properly test the firmware. They are not doing public beta tests (releasing the new firmware to volunteers a couple of weeks early) to find out if there are any bugs they haven’t found in their inadequate testing. The last three major releases have been pulled within a few days or the release due to showstopper bugs, to be followed with a fixed release a week or two (or three) later. Kobo developers are spending too much time adding marketing features to the firmware, and not enough time fixing the existing bugs, or testing the new features. Making things worse, Kobo has decided to split the firmware release by device, at least for the Touch and Glo. While they are basically the same device and firmware, Kobo now has two code bases to keep track of rather than one. And two sets of bugs, and fixes, etc. Of course, they removed the device indicator from the firmware release file (from Kobo3-update-2.1.4 [Touch] Kobo4-update-2.1.4 [Glo] to Kobo-update-2.1.5) and kept the same numbering. Anything that can lead to confusion, especially in the development/release process is bad. And…. on the Glo, Kobo has removed the ability to do a factory reset on a non-functioning unit. On the Touch, the paperclip reset (hardware reset) was a factory reset, on the Glo it is a basic reset and you can only do the factory reset from the menus. Err, no, that’s just false… the paperclip reset just forces a poweroff in case the unit is non-responsive. A factory reset was performed by holding the Home button while powering the Unit on (in case the unit was not working well enough to go through the menus.). Reportedly (I haven’t tested this myself,) the same can be done with the Glo by holding the light button while powering on. Actually on the Touch, the Home button was part of the factory reset. Sometimes it required the paperclip, sometimes not. Having been the victim of Kobo’s firmware release killing Australian devices, I got very intimate with factory resetting. Yes, the light button with power-on will factory reset on the Glo (not htat I’ve looked for it). However, this doesn’t seem to be widely publicised by Kobo. In fact, you cannot find out how to factory reset your Glo on their website (at least by asking the question: how do i factory reset my glo). Kobo has to be the most schizophrenic company I’ve ever seen. On the one hand, the hardware is probably the most friendly and open design available. Firmware is installed on a normal SD card that can be removed and manipulated like any other. The built in factory reset not only clears up the user accessible memory, but also restores original firmware in case user somehow manages to damage that as well. On the other hand, they try very hard project the most hostile anti-customer communications. They are the only e-reader company that tries to hide firmware update downloads. I admit that sounds like a non-event nitpick, but the unfriendly and unhelpful attitude transmit to everything I see them do. Do you mean the “You Broke it” quote? And now I have to eat a big heaping tablespoon of crow. According to mdclements, the factory reset mode stops doesn’t work when the incorrect firmware loaded, so would not have helped the user in question. Sorry. Don’t worry about it. Kobo’s communication is so horrible that we don’t know much about how to operate their hardware. And, you have to admit, no rational person would expect Kobo (or anyone for that matter) to allow the loading of incorrect firmware to break their device, with no possible way to recover. Completely amateur behavior. Quite the contrary, any device can be rendered useless by loading incorrect firmware, including but not limited to the Motherboard on your PC. This is one thing I have to give Kobo kudos for. The Kobo glo is the most open and accessible tablet device I’ve ever seen or heard of. I got so ticked off at my Kobo Touch that after replacing it once and it still never worked right, I just pitched it in the trash. Their customer service sucked so bad, that it wasn’t worth going through that hassle a second go around. There was a time that I really wanted t0 love Kobo. I am a sucker for the underdog. But not when the dog bites the owner….twice. Why is this email odd or telling? All this says to me is that demo units were supplied to stores without information on how to reset the devices, which is asking for trouble. Customers do all sorts of crap to demo units (as do ignorant staff, in some cases), and obviously management should know how to reset them. Last time I visited a busy JB Hi-Fi store, I struggled to find a demo reader of any brand that was working. Had to chase down a staff member to reset and demo them. I guess cause the e-mail starts out like this….. It says particularly the Kobo Glo. Plus the Kobo Touch never really ever worked right. But these indie-store Glos and Minis are supposed to be tied by unique ID to the retailer, so that a small bit of change (8.4%) will kick back to the retailer for books purchased on the device. My guess is that there is something else the customer (or retailer?) has to do to make this magic happen, and this may be the source of the syncing problem, but the ABA hasn’t told any customers or retailers what the magic steps are, so it’s all guessing at this point. My two cents: I like the Glo: Lighter than the touch, more responsive, and easy on the eyes. I imagine the sync problem will be fixed with a firmware update, but it’s of little consequence to me as I personally strip and sideload everything I read. But that fix should really really really really happen before the ABA/indie retailers start unleashing these things on noobs and find themselves becoming Kobo tech support and trying to placate angry customers. Your device should sync, regardless of any deal between Kobo and the retailer. Nor should your device require anything other than the normal startup sync with Desktop (or Wifi) to work properly. Well, it doesn’t. My Touch and 2 Android clients sync, but not this Glo. Even with security completely disabled on my router, books wouldn’t sync. I even see the “Content” phase of the sync flash (briefly) across the top of the Glo’s screen, and when finished I get a new “Last sync” date and time, but nada on the actual books. And the Desktop software also just drops the ball during sync to the Glo when it comes time to hit the book portion of the show. Slow prograss-bar crawl, lower left corner of the Kobo Desktop window, then ZIP – sync reported as complete. No new books. I’m not trying to be argumentative – just reporting what I see. Sorry, I think you misunderstood me. I wasn’t saying that your device should sync, in that you were doing something wrong. What I was saying is that your device should sync, in that nothing between your retailer and Kobo should prevent your Glo from syncing. Basically, it’s Kobo’s fault, not yours. I think there’s a generic problem with the Glos syncing. I’m not completely sure, as I don’t have a Glo, so I mostly ignore Glo only issues. Instructions say for the customer to contact Kobo for support. Good luck with that. Sorry your having issues with your unit. I would like to see one of these working some time. Yeah, I’m ignoring the sync issue right now, and just trying to figure out how I can confirm that my e-book purchases will actually be linked to my local indie store for their whopping (8.4%) cut. I found (via googling) some communications which said that the Kobo account would have to either be created on the device (check! ), or created through a special link on the store’s website (which my local doesn’t have up yet). Unfortunately the ABA is overwhelmed with Sandy fallout, and the Kobo website’s links to “Contact Us” for “Customer Care” are all… well, it sounds like you already know. I have a gut feeling that the lion’s share of integration work will be falling on the ABA, and they’re in no position to be tweaking websites right now. I am having an issue with my glo. It seems dead, when i plug it into my computer the led glows green as if it was charging but it is not recognized and it also gets stuck with the green led after it is unplugged. It doesn’t want to turn on, when i flick the power switch nothing happens, no led no screen flash. I have tired a reset(paper clip reset) and all the happens is the led blinks green, then blue, and then the screen blinks black and after nothing. I have left it charging for about 6 hours and nothing. The screen is blank. Any ideas what the issue could be. It sounds as if your problemis the same as what I had. After chatting to kobo (doing several resets), they told me to return the glo to the retailer since the unit seemed to be stuck in an infinite loop of plug in/restoring. Instead, I just tried all kinds of combinations of plugging charger in/out while pressing power on/off, holding the light switch, inserting paper clip etc etc. Finally the unit got out of the loop, restored and has since been working ok. I am however amazed by how often the unit wants to do a restore at its own initiative (is this a hidden firmware/OS update?). i just had the same issue. I think this is how it is fixed. put in the usb plug with pc on. paper clip in the hole and hold the light button down.